Liverseedgrass (Urochloa panicoides) is a monocot weed in the Poaceae family. In Argentina this weed first evolved resistance to Group G/9 herbicides in 2017 and infests Corn (maize), and Soybean. Group G/9 herbicides are known as EPSP synthase inhibitors (Inhibition of EPSP synthase). Research has shown that these particular biotypes are resistant to glyphosate and they may be cross-resistant to other Group G/9 herbicides. Greenhouse trials comparing a known susceptible Liverseedgrass biotype with this Liverseedgrass biotype have been used to confirm resistance. For further information on the tests conducted please contact the local weed scientists that provided this information. There is no record of differences in fitness or competitiveness of these resistant biotypes when compared to that of normal susceptible biotypes. If you have any information pertaining to the fitness of Group G/9 resistant Liverseedgrass from Argentina please update the database. The Herbicide Resistance Action Committee, The Weed Science Society of America, and weed scientists in Argentina have been instrumental in providing you this information. Particular thanks is given to Marcelo De La Vega, and Exequiel Varela for providing detailed information. Widderick, M. J. ; McLean, A. R. ; Walker, S. R.. 2012. Non-chemical options for managing the seed bank of glyphosate resistant weeds. : 279 - 280. Glyphosate resistance is becoming a common problem in farming systems of the subtropical cropping region of Australia. Glyphosateresistance has been confirmed in awnless barnyard grass (Echinochloa colona L. (Link)), liverseed grass (Urochloa panicoides P.Beauv. ), flaxleaf fleabane (Conyza bonariensis (L.) Cronquist), windmill grass (Chloris truncata R.Br.) and annual ryegrass (Lolium rigidum (Gaud.)) (Preston 2012). As well, common sowthistle (Sonchus oleraceus L.) was identified at high risk of developing glyphosate resistance. To prevent further glyphosate resistance and to improve management of existing glyphosate resistant populations, alternative management tactics for these key weeds are required. This paper reports on the impact of different tillage and stubble treatments on emergence and persistence of awnless barnyard grass and common sowthistle in two experiments located in southern Darling Downs, Queensland..
Werth, J. ; Thornby, D. ; Walker, S.. 2011. Assessing weeds at risk of evolving glyphosate resistance in Australian sub-tropical glyphosate-resistant cotton systems. Crop & Pasture Science 62 : 1002 - 1009. Glyphosate resistance will have a major impact on current cropping practices in glyphosate-resistant cotton systems. A framework for a risk assessment for weed species and management practices used in cropping systems with glyphosate-resistant cotton will aid decision making for resistance management. We developed this framework and then assessed the biological characteristics of 65 species and management practices from 50 cotton growers. This enabled us to predict the species most likely to evolve resistance, and the situations in which resistance is most likely to occur. Species with the highest resistance risk were Brachiaria eruciformis, Conyza bonariensis, Urochloa panicoides, Chloris virgata, Sonchus oleraceus and Echinochloa colona. The summer fallow and non-irrigated glyphosate-resistant cotton were the highest risk phases in the cropping system. When weed species and management practices were combined, C. bonariensis in summer fallow and other winter crops were at very high risk. S. oleraceus had very high risk in summer and winter fallow, as did C. virgata and E. colona in summer fallow. This study enables growers to identify potential resistance risks in the species present and management practices used on their farm, which will to facilitate a more targeted weed management approach to prevent development of glyphosate resistance..
Preston, C.. 2010. Managing glyphosate resistant weeds in Australia. : 250 - 253. Glyphosate resistance has evolved in three grass weed species in Australia. By far the greatest problem is with Lolium rigidum Gaudin, but more recently resistant populations of Echinochloa colona (L.) Link and Urochloa panicoides P.Beauv. have been reported. Glyphosate resistance occurs in a wide range of situations including grain cropping, chemical fallows, in orchards, vineyards, along irrigation channels, along fence lines, railway rights of way and roadsides. Glyphosate resistance occurs where glyphosate has been intensively used, either once or many times per year, where no other effective herbicides are applied and where no other effective weed management is conducted. The rate and annual intensity of glyphosate use is not well correlated with the appearance of glyphosate resistance. Instead, the lack of other weed management practices is a better predictor of resistance. The Australian Glyphosate Sustainability Working Group (AGSWG) is a cross-industry group with the aim of identifying and disseminating key information and strategies for the management of glyphosate resistant weeds to all sectors in Australia. It provides information on confirmed cases of resistance, answers to glyphosate resistance issues and strategies for management of glyphosate resistance. By providing clear and consistent messages about glyphosate resistance across industry sectors it is hoped to reduce the incidence and impact of glyphosate-resistant weeds..
Werth, J. ; Preston, C. ; Roberts, G. ; Taylor, I.. 2004. Glyphosate resistance management in Roundup Ready® cotton. : 95 - 98. Cotton is the first broad acre crop in Australia to have genetically modified (GM) herbicide-tolerant cultivars commercially available. The introduction of glyphosate-tolerant cotton into Australian farming systems will have an effect on conventional weed management practices, the weed species present and the risks of resistance to glyphosate evolving in weeds. It is therefore important that the effects of these management practices, particularly a potential reduction in Integrated Weed Management (IWM) practices, be examined for their influence on weed population dynamics and resistance selection. The aim of this study was to develop a framework to assess the potential for glyphosate resistance evolution in Roundup Ready cotton systems. A survey of cotton growers was conducted in Queensland and New South Wales to assess weed populations, weed management strategies and herbicide use patterns in Roundup Ready compared to conventional crops. An investigation of the population dynamics of weeds, using barnyard grass (Echinochloa colona) and liverseed grass (Urochloa panicoides) as model weeds, and the impact of management practices on these weeds has started. The treatments consist of an IWM (including the use of herbicides, cultivation and hand-hoeing) approach with and without Roundup Ready technology, a half IWM approach with Roundup Ready, and utilizing Roundup Ready only. In conclusion, treatments with IWM components provided the most effective control of the grass weeds. However, Roundup Ready only treatment was also commercially acceptable, but still allowed a small number of grass weeds to survive. Studies are also underway to measure the effect of plant densities on growth and reproduction of barnyard grass and liverseed grass in terms of biomass and seed production both intra-specifically and inter-specifically with cotton. These experiments will provide information for the development of a model that will attempt to predict the likelihood of glyphosate resistance evolution over a range of management strategies, initially for grass species, and later for a range of weed species. This will facilitate the development of sustainable weed management practices in Roundup Ready cotton..
Walker, S. ; Osten, V. ; Storrie, A. ; Robinson, G. ; Cook, T. ; Galea, K.. 2002. Weeds at risk of developing herbicide resistance in the different cropping systems of the northern region. : 620 - 621. Herbicide resistance is an increasing concern in the northern grain region with 10 weed species confirmed resistant in the last decade. A new project is identifying additional weeds and cropping systems that are at risk of developing resistance in the near future. This is being achieved by collating information and calculating a risk score for each main weed based on herbicide use patterns for the different crop rotations across the region. Several examples are presented for the main in-crop and fallow weeds of southern Queensland. The crop rotation of the northern region consisted of barley, chickpea, cotton, mung bean, oat, sorghum, sunflower and wheat. The main crops in southern Queensland were wheat (32%), sorghum (20%), cotton (13%), barley (11%) and chickpea (10%). Eighty-one weed species were identified in the southern Queensland surveys. 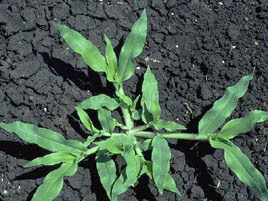 Common sowthistle (Sonchus oleraceus) was the most widespread weed n both crops and fallows. Turnip weed (Rapistrum rugosum), wild oats (Avena spp. ), black bindweed (Fallopia convolvulus), liverseed grass (Urochloa panicoides), barnyard grass (Echinochloa spp. ), bladder ketma (Hibiscus trionum), pigweed (Portulaca oleracea) and caltrop (Tribulus terrestris) were similar in ranked importance in both crops and fallows. Risk assessments indicate that wild oats have a high risk for resistance to Group A herbicides, common sowthistle and black bindweed to Group B, and barnyard grass and common sowthistle to Group M herbicides..